daisychestnut’s vintage vegetable garden markers can be found on Etsy. See links below. Recycling vintage items is a love of mine. There’s nothing that compares to re-purposing beautiful things. Springtime is one of the very best times to renew vintage and antique lovelies; especially in the garden. It’s always nice when you’re driving around or taking a stroll and people are working or reworking their gardens. Around here, gardening makes for a great conversation starter. You’ll see people stopping their cars or taking a pause in their walks to talk to a gardener at work. Yes, we love our gardens; and we get most of our gardening tips from word of mouth. Our gardens are not always visible to others, however. Often times the most beloved parts of our gardens are enjoyed only by ourselves, our families, and our visitors; our personal eye candy, our beloved spots that we tend to and relax with. We tend to get a bit more eccentric and experimental with these parts of our gardens than we do with our public gardens. They are not always as perfect and tidy looking as our front yards. And Most of us have our special trinkets and gardening decor, like sun-catchers on spokes, copper sprinklers, gnomes, and the like, here. 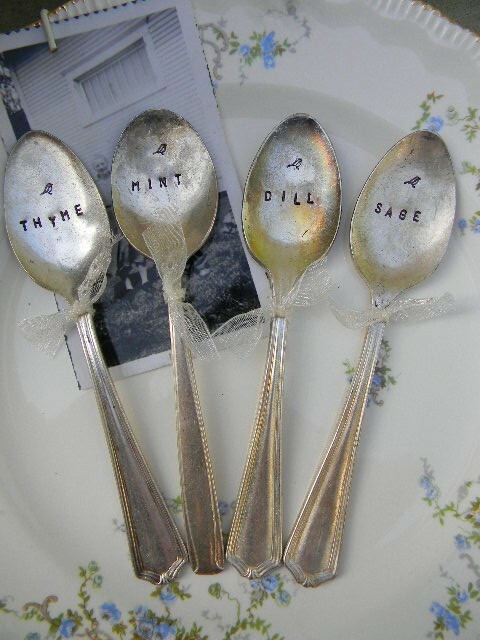 For $6 US, Red Bench Designs has lovely personalized vintage silver spoon garden/plant markers. We are also more likely to set out exposed plant markers, so that we can keep our gardens labeled for easy care and easy picking; usually they are the ones that came in the plant container. But they’re not all that beautiful, and they don’t always stay put. 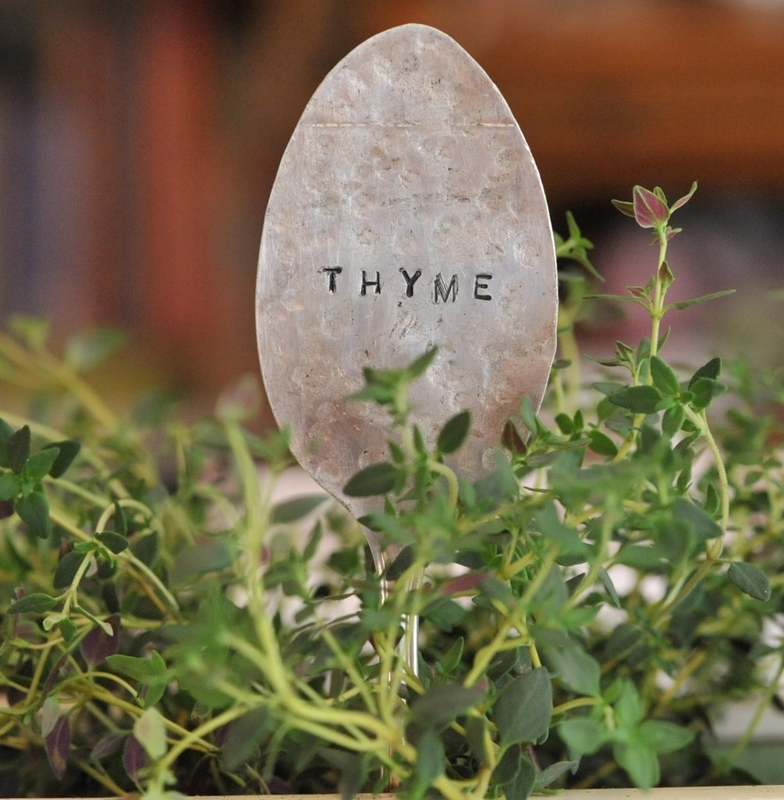 Here is my favourite way to mark my herbs and flowers. It is not only a beautiful look, but it is a weather resistant and sturdy alternative. It involves recycling silverware (a plus), reinventing vintage and antique items (another plus), and it brings a bit of history into your lovely garden space. You can buy silverware garden markers. Etsy has quite a few shops that offer a variety of beautiful and unique markers in various sizes and styles. This is fine if you only need a handful, as your expense would be significantly less than making them on your own. However making garden/plant silverware markers of your own is quite fulfilling, doesn’t require much time or tools or energy, and can be made right in the midst of your very own garden. Not to mention you can make as many as you like, for any garden, on any given year, at any given time, for yourself, and for your friends and family. Yes, they make wonderful gifts (another plus). Pick 4 for $22.99 US at Pretty Paris on Etsy. They are located in Orange County, California. Check out their other etched vintage flatware for Gardening or other occations. Their authentic vintage look is just too cute. 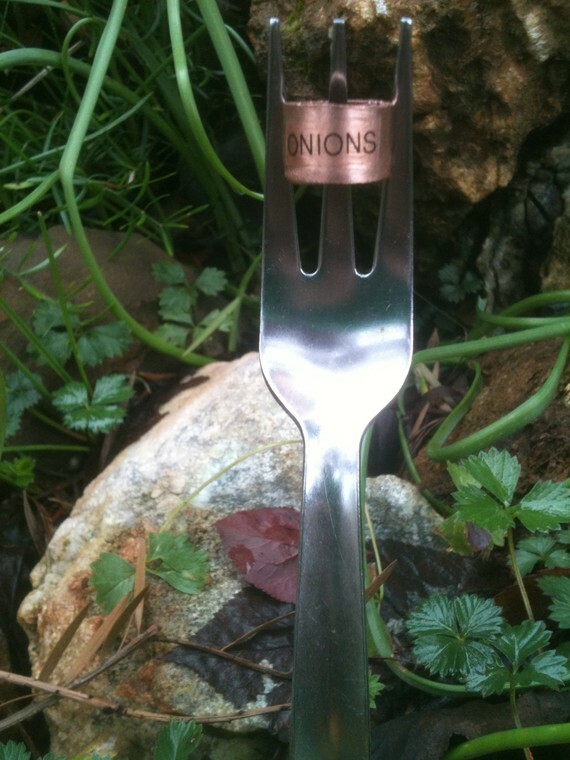 Cici’s Vintage offers these great garden flatware markers that come with 16 interchangeable copper labels. I love the look. Monkeys Always Look,(and i seem to be too). This Etsy shop has a fantastic variety of custom and personalized garden markers stamped on antique or vintage silverware. 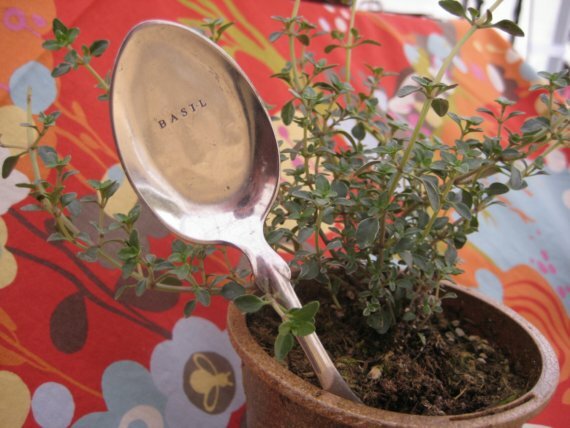 Absolutely gorgeous, spoon herb garden markers by daisychestnut on Etsy. These really take my breath away. Vintage silverware spoon flower garden markers, also by daisychestnut on Etsy.